The Focus SoftColors 1-2 Week from CIBA Vision / Wesley Jessen is a 1-2 week lens designed to enhance and brighten the color of light eyes. This lens has been approved by the FDA for 1-7 days of extended wear, or 2 weeks of daily wear (depending on your prescription). Available in three beautiful and natural-looking shades --Royal Blue, Aqua, or Evergreen—these disposable lenses are a convenient and healthy choice in contact lenses. The Focus 1-2 Week Softcolors lenses, made by CIBA Vision, are made for those who are looking to change or enhance the color of their eyes with a daily or extended wear contact lens. 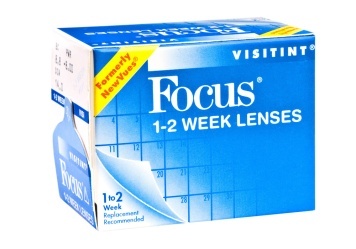 These lenses can be prescribed as a daily wear lens or as an extended wear lens from one to seven days. Your eye care professional will determine the right cleaning and replacement schedule for your particular situation. The colors of these lenses were designed to be worn by those with light colored eyes. While you will still be able to wear them if you have darker eyes, the change will not be as apparent. Your eye care professional will be able to let you know if these are the right lenses for your need. Even with the one to two week replacement schedule, your eye doctor may prescribe a different replacement schedule for you. In patients who are not accustomed to wearing contact lenses, the eye care professional may begin with a more stringent replacement schedule. Your color choices for the Focus 1-2 week Softcolors lenses are available in aqua, royal blue and evergreen. The natural look of the lenses makes them an ideal choice for those who are enhancing their natural eye color.